Our Editor is obsessed by the idea as some of our articles might be slightly contentious that he’ll be bumped off by a government secret service hunter killer agent. So if you should read about him being found naked, strung up by his belt from a cupboard door with an orange stuffed in his mouth and a stocking over his head you’ll know they won’t have got to him (‘You’re fired!’ – Ed). Gerard Butler, having been around for twenty years now and having made a brief foray into box office dud rom-coms such as ‘PS I Love you’ has now firmly esconsced himself in the action film genre, some having been great fun (300, Olympus has Fallen) some have been middle of the road but still decent (Den of Thieves) and then there there’s Gods of Egypt and Geostorm. So after those last two there’s a certain degree of trepidation when we see his name attached to a film. Hunter Killer is one of those thrillers that could easily have been set during the Cold War and starts with a Russian submarine have been mysteriously torpedoed in the Arctic. It’s down to an untested US submarine Captain Joe Glass (Gerard Butler) to commandeer a submarine to the downed area to run concurrently with a small covert Navy Seals unit who infiltrates a Russian naval fjord. It’s whilst the SEALS are there that they witness a coup by a swivel eyed Russian general that has the Russian president held captive and several of his ministers shot dead and dumped in the sea. The action alternatives between Butlers captain who rescues the Russian submarine captain, the navy SEALS, the rogue Russian general and the US Chief of Staff (Gary Oldman) some working together but all heading towards all out war between the two superpowers. It’s Butler who inevitably gambles and under the guidance of the rescue Russian sub captain they head into the fjord and to meet with the SEALS who have been tasked to rescue the Russian president. 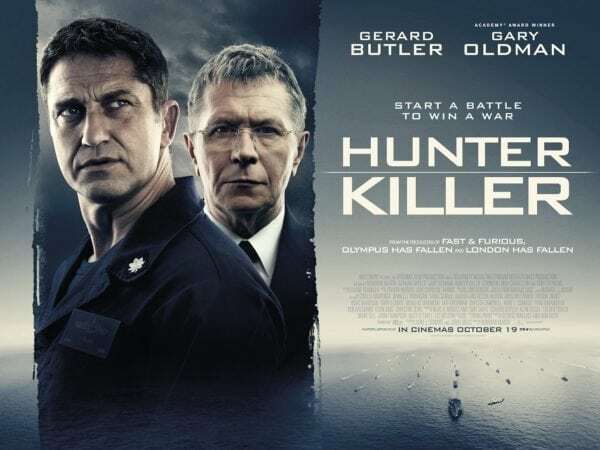 So yes it is far fetched and ludicrous but Hunter Killer turns out to be far better than might be expected with the action escalating to some terrific set pieces and stand offs all well handled by director Donovan Marsh whose previous films have been largely forgettable. 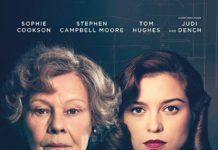 Butler may be too young to play a submarine captain in a way that someone like Gene Hackman convinces but this is refreshing in that this a throwback to all male casts with only two very minor females roles. Oldman having won an Oscar for Darkest Hour continues the tradition of a winner’s next film being an easy pay day beneath their talents and here he plays the shouty war mongering US Chief of Staffs. Added to this is rapper Common (whose surname we can only presume he dropped because it was ‘AsMuck’) turning in a decent performance as the US admiral though again he’s probably too young for such a role. Hunter Killer was also one of the last films of actor Michael Nyqvist who plays the rescued Russian sub captain. Great in The Colony he was even better in the original version of The Girl with the Dragon Tattoo and its a shame that just as he was making it in Hollywood he passed away due to lung cancer. Adapted from the book ‘Firing Point’ this has everything from submarine cat and mouse missile moments to barnstorming shoot outs that look like sense for Call of Duty and Hunter Killer escalates to a terrifically tense third act though the outcome is never in doubt. Submarine thrillers with their claustrophobic settings can make great thrillers and whether it’s the realism of ‘Das Boot’ to the history rewriting ‘U-571’ to all out entertainment such as ‘The Hunt of Red October’ this is great fun. Here’s the Hunter Killer trailer…….